I look forward to this time of year all year long, and yet, somehow time gets away from me, and I don't always plan appropriately. I don't like feeling rushed in any situation, but I really don't like feeling rushed to write holiday cards. Real mail is scarce in this day and age, so it's extra important to take the time to write a nice note. Fortunately, with a little reminder from my childhood friend, Anna at Life Lessons, I have already designed and ordered holiday postcards from Vista Print! We put one of our beautiful wedding photos to good use for our holiday postcard. And I love it! Simple, classic, and downright inexpensive. And by inexpensive, I mean I paid less than $15 for 100 postcards including shipping. People, don't underestimate the power of Vista Print. And as Anna pointed out on her blog, postcard postage is only 29 cents! Tip #1: Search Google for "Vista Print 100 free postcards"
The website is sneaky in that it caters to the viewer and his/her website traffic. If you go straight to the website, you will not be able to find a "100 free postcards" deal. Tip #2: Create your own postcard using a blank template to get 100 free. If you select from the holiday category, the deal doesn't apply. 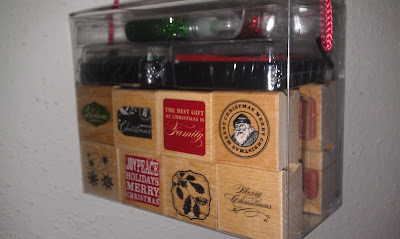 I've fallen in love with rubber stamps recently, and to my delight, I found a holiday stamp set (16 stamps, 2 ink pads, 2 mini glitter pens) at Michaels on sale for $4.99! Stamps are usually a couple bucks each, so this was an absolute steal. I can't wait to send our postcards out with a little extra rubber stamp cheer. Also, please visit Anna over at Life Lessons. I met her when we were wee ones in the same performing arts program. She was little Annie Warbucks to my Sheila Kelly -- one of the villains, for those who haven't seen the sequel, Annie Warbucks. (Fact: AW broke all off-Broadway records in 1993 but exceeded the maximum amount of performances to be nominated for Tony Awards which jeopardized its move to Broadway.) Anna is busting at the seams with cuteness and class, and she posts all sorts of crafty, yummy, and wise things. You will love her! Unlike my blog, hers is written for a wider audience. Check her out! My Friend is a Mermaid. Thanks to You and You and You!